From January through June of 2018, net natural gas exports from the United States averaged 0.87 billion cubic feet per day (Bcf/d), more than double the average daily net exports during all of 2017 (0.34 Bcf/d). The United States, which became a net natural gas exporter on an annual basis in 2017 for the first time in almost 60 years, has continued to export more natural gas than it imports for five of the first six months in 2018. U.S. natural gas exports have increased primarily with the addition of new liquefied natural gas (LNG) export facilities in the Lower 48 states. U.S. exports of LNG through the first half of 2018 rose 58% compared with the same period in 2017, averaging 2.72 Bcf/d. Total U.S. LNG export capacity reached 3.6 Bcf/d in March 2018. The LNG facility at Sabine Pass in Louisiana has an export capacity of 2.8 Bcf/d, which includes the recently completed Train 4. Cove Point LNG in Maryland, which has an export capacity of 0.8 Bcf/d, delivered its first cargo in March 2018 and entered full commercial service in April. In the first two full months of operation after the capacity additions (May and June), Cove Point exported an average of 0.57 Bcf/d (76%) of its nameplate capacity. Another four LNG facilities are under construction and planned to enter into service by the end of 2019, ultimately increasing U.S. LNG export capacity to 9.6 Bcf/d. While U.S. LNG exports have continued to grow in 2018, U.S. natural gas pipeline import and export volumes have either remained relatively flat or declined from 2017 levels. Exports of natural gas by pipeline to Mexico grew by just 4%, while exports of natural gas by pipeline to Canada declined 14%. Most of this decline occurred in deliveries from St. Clair, Michigan, to the Dawn hub in Ontario, Canada. 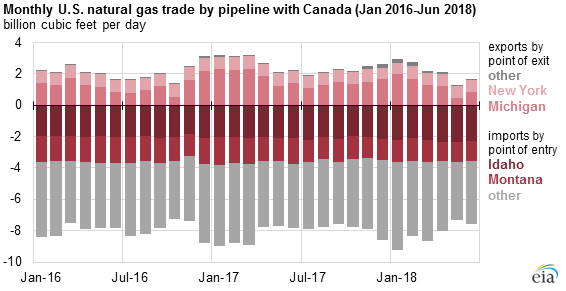 Although U.S. exports into eastern Canada declined, eastbound flows on the TransCanada Mainline from western Canada increased by 0.26 Bcf/d from 2017 as tolls on the pipeline were lowered this year, according to data from Canada’s National Energy Board. January was the only month so far in 2018 in which the United States was not a net exporter of natural gas. In that month, extreme and prolonged low temperatures led to record demand for natural gas. U.S. natural gas imports from Canada during January averaged 9.25 Bcf/d, its highest level since January 2014. Monthly average U.S. LNG imports, which peaked at 0.53 Bcf/d in January, were also higher this winter than in the previous two winters. Although most LNG cargos are contracted too far in advance to respond to weather events, one cargo containing 3.1 Bcf of LNG was purchased on the spot market and delivered to the LNG import terminal in Everett, Massachusetts, on January 28 to meet increased demand. This one cargo was enough to shift the United States from being a net exporter to a net importer of natural gas for that month. 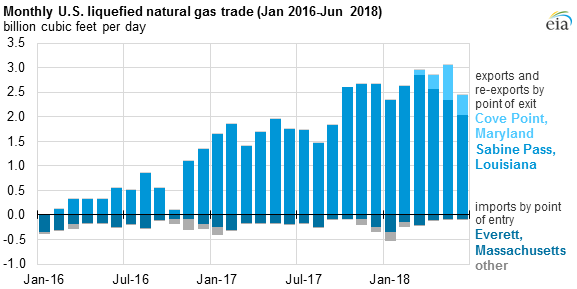 According to EIA’s Short-Term Energy Outlook, net natural gas exports are expected to continue rising through the end of 2018 as additional LNG export capacity comes online and as natural gas infrastructure in Mexico is placed into service. Overall net natural gas exports are expected to average 2.0 Bcf/d in 2018 and 5.8 Bcf/d in 2019.